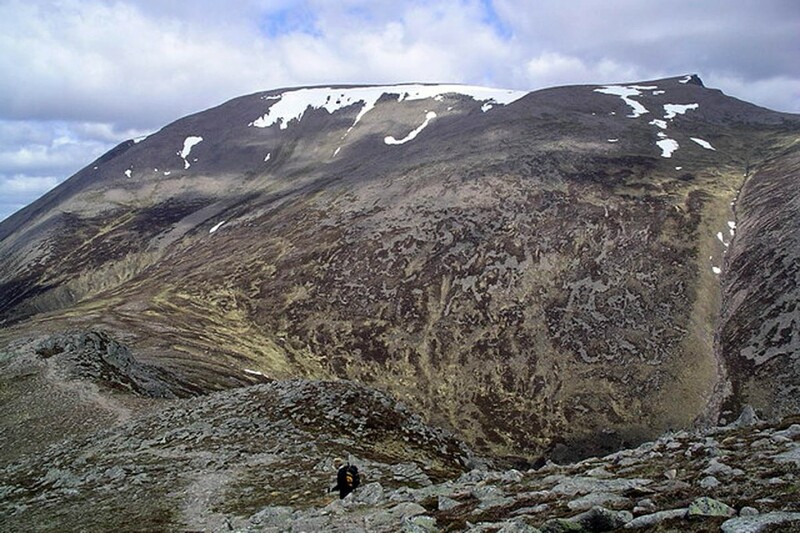 Two walkers were rescued after getting completely lost in the Cairngorms. The pair set off on Wednesday to tackle Britain’s second-highest mountain, Ben Macdui. They were eventually found more than 13km (8 miles) from the peak, at Linn of Dee, and 21km (13 miles) from their starting point at the CairnGorm Mountain ski centre. Cairngorm Mountain Rescue Team spent what a spokesperson called ‘seven brutal hours’ searching the Cairngorms plateau in gale force winds and rain. The Braemar team also joined the hunt for the pair and Aberdeen MRT was also called out but stood down as the walkers were found about 11pm. Rescuers said the two men were lucky. The weather forecast said conditions would be mean, but they were brutal, they said. The spokesperson pointed out that, if you’re using a mobile phone for its navigation app, torch and phone, the whole small package will be unusable if the battery becomes exhausted in the cold after a day on the hill. Some online sources of routes describe ascents of the 1,309m (4,295ft) mountain without emphasising the potential difficulties in poor weather or winter conditions. The team spokesperson said: “Before the inevitable debate kicks off about preparedness, we just want to say that we don’t mind rescuing people; we don’t judge and we appreciate that some people don’t realise what they are undertaking, not least as the online description of a nice day out may not factor in the weather. The Cairngorm team posted a Facebook video showing conditions during the search. Sound advice that applies to all mountain areas. Disappointed to receive a promotional add from Ordnance Survey where they used a comment from a potential customer promoting their online mapping saying that he thought the online mapping was much more convenient to use than a paper map. It's getting stupid now! Dangerous for all concerned and the attitude of a lot of these inexperienced people is just not acceptable! Not only are they risking their own lives but those of the MRT. I used to teach/run D of E award and ALWAYS made sure that at Bronze level they all new how to use a Map & Compass, the importance and risks without. Surely it's time for this type of approach with adults too!?! We all love the Mountains and the health benefits are great, if approached with knowledge and basic training or awareness. Correct equipment and a sensible attitude. I don't like to see anyone get hurt and I do hope these guys and other people with finalkyrealise what they need to do to prepare properly. Matt, good idea, though still need to 'know how to navigate' using a map and compass. Doesn't help much when a map is hauled out after an electronic device fails if the person doesn't understand how to use it.